Cheaper iCloud storage prices just went into effect, making the service more competitive with Dropbox, Amazon Cloud Drive, Microsoft OneDrive, and Google Drive. The 200GB tier is now $2.99 a month, a dollar cheaper than before. 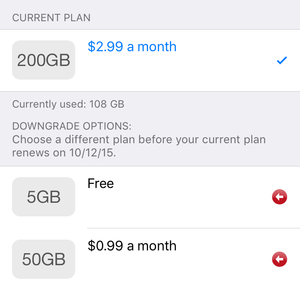 Apple dropped the 500GB tier entirely, but slashed the price for 1TB by $10 a month: it’s just $9.99 a month now. Subscribers at the 500GB tier are automatically upgraded to 1TB since the price is the same. You can downgrade or upgrade via Settings > iCloud > Manage Storage > Change Storage Plan or Buy More Storage. iCloud upgrades and downgrades can be made directly within iOS. The new prices make Apple’s storage more in line with competitors like Amazon, Dropbox, Google, and Microsoft (see chart). 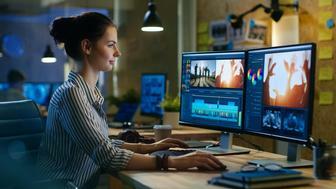 None of the other services can handle automated iOS backups, but all have various options for photo uploading and synchronizing and local file access through iOS apps. iCloud storage can be used for iOS backups, iCloud Photo Library, iCloud Drive, email, and other less-storage intensive purposes. 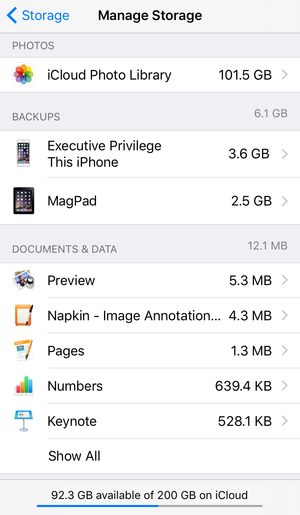 iOS backs up data, but not apps, and you can manage which apps back up their data in Settings > iCloud > Storage > Manage Storage by tapping a device. 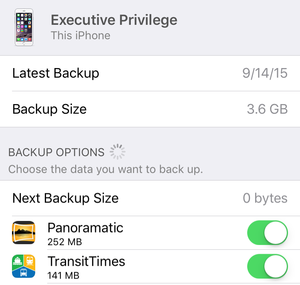 You can choose for each app whether or not to include its locally stored data in an iCloud backup. iOS shows overall iCloud storage use and broken down into iCloud Photo Library, by device, and for iCloud Drive. Existing subscribers start paying the lower price at their next renewal. There’s no prorated refund for part of the current billing cycle.